Knowledge is power. As the leading mantra here in Kenya, it comes as no surprise that the enrollment rate for primary education stands above eighty percent; literacy among youths a whooping ninety-three percent! Parents making meager wages will sacrifice almost anything to ensure their children have an education that they themselves did not get. As my visits to Zidisha borrowers grow, a trend in loan impact reveals itself, for although microfinance was initiated to provide services to uplift small businesses, many see it as a way to empower their children through education. 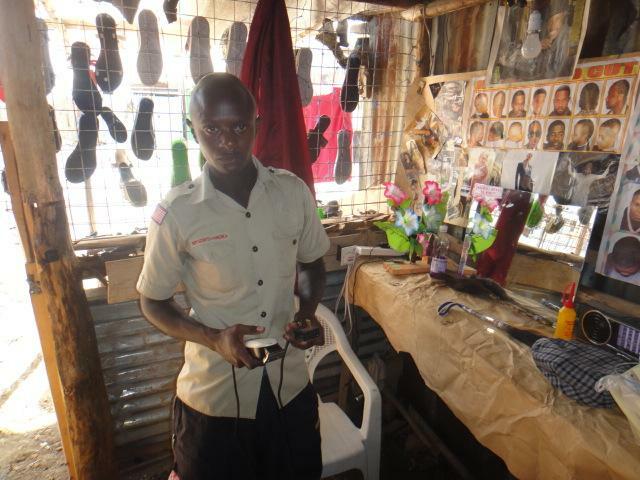 Richard Mwathi, former owner of a kinyozi (barbershop) in Lanet, Nakuru is the proud father of three teenage boys. With one in Form 4, another in Standard 8, and the eldest enrolled in Egerton University studying natural environment, paying for school fees is no easy feat. Richard’s Zidisha loan was used to pay for tuition, and although he intended to pay back his loan with the revenue acquired through his kinyozi, sales dropped and he decided to close his business. 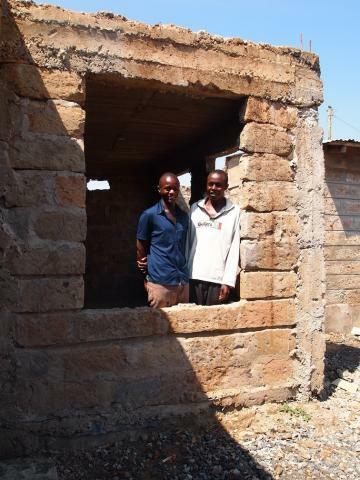 Seeing better opportunities in Nairobi, Richard is currently living with his sister and nephew in Utawala, while his children continue to attend school in Nakuru. 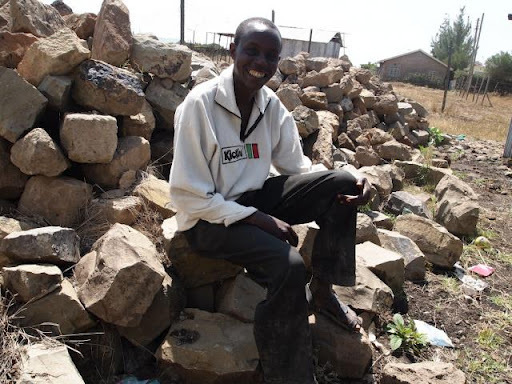 Hoping to accrue enough money to pay back his loan, Richard is working odd jobs at the many construction sites in Utawala. Construction work being on a need only basis and one of the only options for many without additional employment, Richard waits eagerly to be called upon. With elections so close at hand, many construction sites are also at a standstill, lying in wait to see what the new government will bring. Richard’s struggles are apparent on his face, but his optimism for the future is also unyielding. Making repayments more manageable, Richard has decided to make small weekly installments starting in October. He will continue to stay in Nairobi until the end of the year, seeking opportunities in the growing town of Utawala. My visit with Richard ends on a light-hearted note while we take photos outside and I get a grand tour of a new house his sister is in the process of building. Thank you Richard and family for inviting me to your home, and I wish you all the best in your future endeavors. Hello, my name is Traci Yoshiyama, Zidisha’s Kenya Client Relationship Manager. I am currently residing in Mugaa, visiting Zidisha borrowers in nearby villages. “I’m very hard working,” says Jane Wambui without a tinge of boastfulness, but rather a sense of pride. Rightfully so, Jane is 27 years old and already a successful businesswoman, not to mention a mother of two. 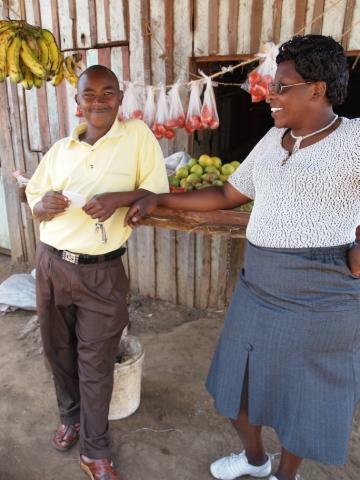 Jane and her husband own a kinyozi (salon) and a produce stall in Miti Mingi. 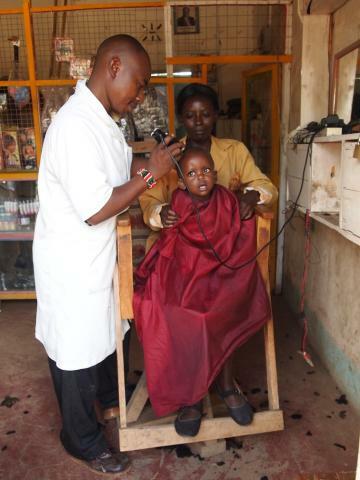 As Jane and I speak from her stall, we peer across the street at the kinyozi where we can see her husband cutting the hair of a young gentleman. In another minute, Jane gets a customer wanting to buy bananas, evidence that their two businesses are thriving. Jane is an experienced Zidisha member, already repaying her 2nd loan. She comments on how she finished repaying her first loan 4 months early, and she anticipates following this example for her second. The creation of her family’s kinyozi was possible because of Zidisha. Through her first loan of Ksh 50,000, Jane was able to rent a space, buy all the necessary machinery (i.e. shavers, razors), stock her store with hair products and shoes, and even buy two batteries that enable her shop to stay open during the frequent power outages. While her husband is in charge of styling the men, Jane takes care of the children haircuts when not working at her produce stall. We have all heard of children being fearful of haircuts, with scissors too close for comfort and strange noises and smells permeating the air. Jane gestures towards her face, implying this is the answer to their haircut jitters. Although both Jane and her husband have no formal training in barbering, she explains to me that, “some courses come from the heart”. To further prove how hard working she is, Jane speaks about her two cows, one of which was bought with her second Zidisha loan. With the milk from her cows, she is able to make Ksh 15,000 a month, which then assists in paying for school fees (both boys are in boarding schools) and rent for her kinyozi. Upon leaving, Jane reaches for a banana, the ripest of the bunch, and gives it to me as a gift. Refusing to take my money, she makes me promise to visit again, even extending an invitation to her home. As I make my 6km descent home, I think about Miti Mingi, one of the smallest villages I have seen in Kenya, but filled with people possessing the biggest of hearts. Meet John Mwathi from Nairobi, Kenya. John started his transportation business in order to provide for his family. Because of the rough terrain in John’s area, donkey carts are one of the only viable methods of transportation. John accredits his businesses success to his affordable prices, efficiently, and speed. John planned to use his Zidisha loan to purchase a motor bike, with some additional money from his personal savings. This would allow John to offer faster service to his customers. However, the best laid plans of mice and men often go astray. My name is Achintya Rai and I am Zidisha’s current Kenya Client Relationship Intern. On 24th March I met John Mwathi at his shop in Utawala, Nairobi. John used to live in Nakuru earlier. He took his loan to purchase a bike, which he intended to use as a taxi (boda-boda). The bike did not give him the returns he expected so he sold it and moved to Nairobi. Now he has a small barbershop. 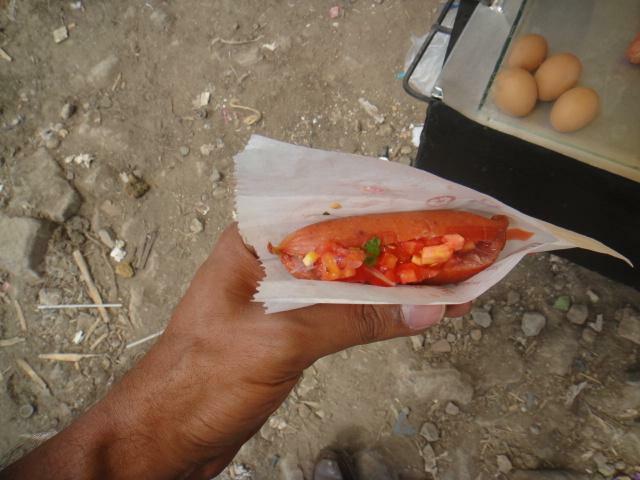 He uses the front of his shop to sell shoes and also has a small kiosk to sell steamed sausages and boiled eggs. John is just 23 and he has already experimented with a number of jobs. After finishing school he did a small course in IT. He then did a course in driving a lorry. He started work by buying a donkey and a cart, which he used to supply water. He also did manual labor to supplement his income. Later John bought his bike. I found John to be a very pleasant person. And even though he seemed a little shy in my presence, he was constantly smiling. He told me the economics of the sausage and eggs business. John’s future plan is to open a snack shop where he can sell hamburgers, cakes, biscuits and chips. After hearing John talk about hamburgers and cakes I was obviously hungry so I decided to buy a sausage. 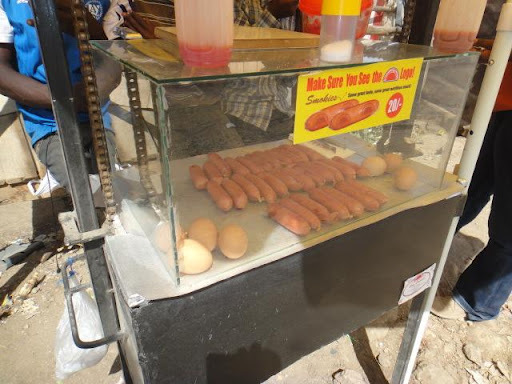 John asked his friend, who was manning the cart at that moment, to move and prepared the sausage for me himself by slitting it and filing it with a salsa like preparation called kachumbari and sprinkling it with salt. It was delicious. John was having trouble making his Zidisha payments because of shifting to Nairobi and starting a whole new business. I helped him reschedule his loan. Having talked to him I feel sure he will be now able to meet his loan commitments.